Photographic Evidence Proves Cash4Books Does Exist! Cash4Books.net, the mythical company that loves to give away real money for books, has just been discovered on Flickr! Long thought to live only in the overpasses and tunnels of the Information Super Highway, this company now appears to exist in the physical world as well. Just look at these pictures! Cash4Books even appears to have a reception area for customers! 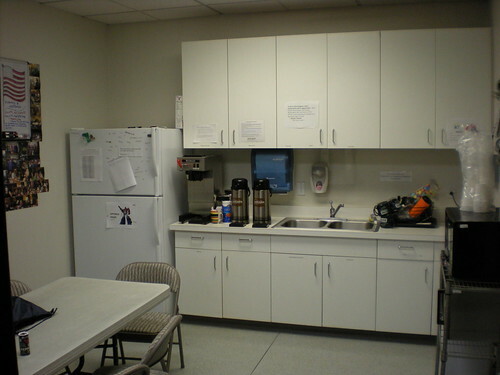 Cash4books even allows its employees to take breaks! The employees are working too hard be photographed! There are tons of pictures on Cash4Books’ Flickr page! Rumor has it that the account will be updated on a regular basis with brand new photos. 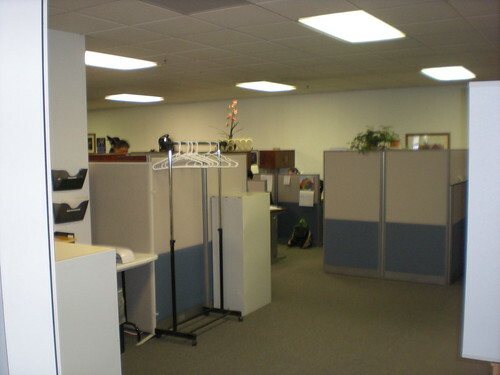 So, check the Flickr page often–you can even add Cash4Books as a contact!–to see what’s happening the office and warehouse. This entry was posted in Cash4Books News & Updates and tagged Cash4Books News & Updates, photography on August 5, 2011 by Jim McKenzie Smith. Hi everyone! Here is our latest Cash4Books.net promo in case you know anyone with textbooks. Pass it on! This entry was posted in Cash4Books News & Updates and tagged cash bonus, Cash4Books News & Updates, make money on February 28, 2011 by Jim McKenzie Smith. Regular readers of this blog may remember this post from a few months back–the one where we unleashed our first Decorate-A-Box Contest. Some of you may be curious to find out who won the contest. Unfortunately, we didn’t have a winner. Actually, we…um…didn’t have any entries. At first, we thought that no one knew what we were looking for, so I was asked to decorate some boxes. I think they turned out well. In this example, I used sharpies and white-out to create an idyllic wintery scene. 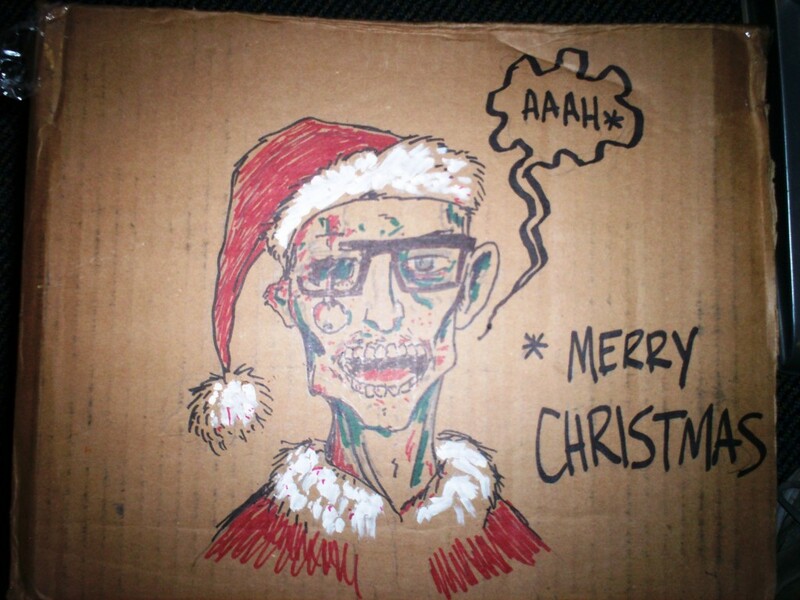 Joan (who also blogs here) asked for a Christmas zombie box. Well, I couldn’t turn away from that challenge. 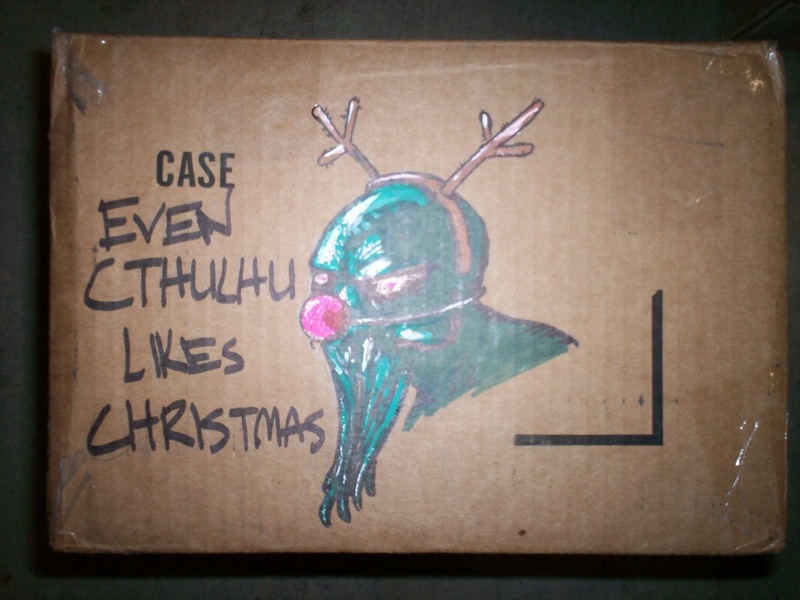 But my favorite is this festive Cthulhu dressed as Rudolph the Red Nose Reindeer. I think I’ve captured the Christmas Spirit very nicely. It’s a shame that no one entered the contest. We were all very excited to see how creative people could be. This entry was posted in Cash4Books News & Updates and tagged box, Cash4Books News & Updates, christmas, contest, creative on January 17, 2011 by Jim McKenzie Smith. And, here is what the Music Maven (Deborah) has about the interview: Attention Independent Artists! You have no idea what’s lining your bookshelves . Tune in to learn how to sell books to raise the funds for advertising, web hosting, marketing, posters or whatever you or your band needs to buy. 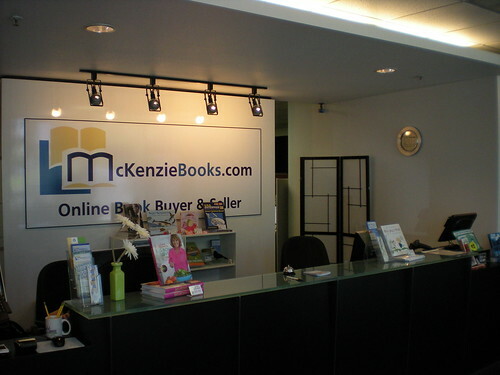 I’ll be interviewing Jim Smith, Founder and CEO of MKZbooks.com and Cash4Books.net. Jim is going to share how you can raise cash through the sale of books! 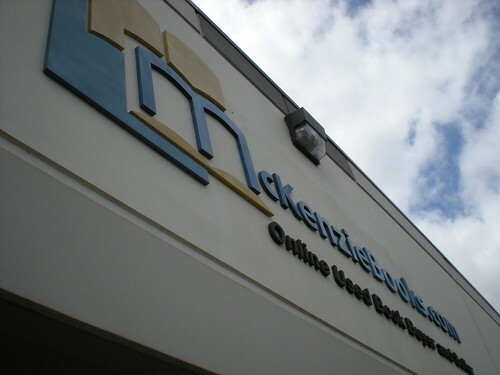 This entry was posted in Cash4Books News & Updates and tagged Cash4Books News & Updates, Fundraising, McKenzie Books on November 18, 2010 by Jim McKenzie Smith. Participate in The 1st Annual Cash4Books “Decorate-A-Box Contest” & Win Awesome Prizes!! We would like to announce the First Annual Cash4Books Decorate-A-Box Contest! Now until December 20th you have a chance to win seriously awesome prizes by simply decorating the outside of your box of books! Why? Because we love being entertained, and rumor has it that customers love getting free stuff! It’s super easy to participate! 1) Sell your books on www.Cash4Books.net. 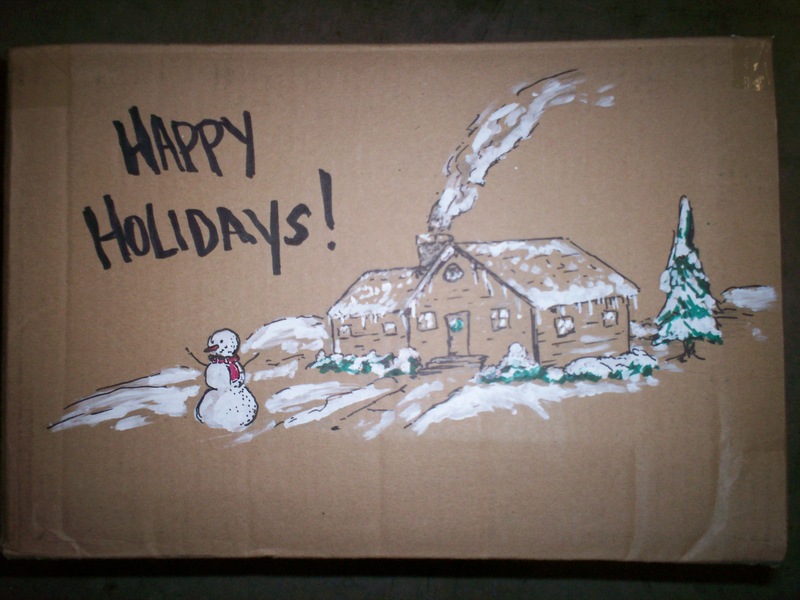 2) Go absolutely crazy decorating your box* and ship your books for free! 3) Once your box of books arrives at our facility, we will take a photograph and post it to our Facebook page for all to vote on! So bust out some craft supplies and get to work have some fun!! 1) Read the “Hairy Details” section (below) and swear an oath that you will abide by the USPS Guidelines. 2) Clear your kitchen table and equip your tool belt with an assortment of markers, a protractor, and that coveted holiday dinosaur stencil set. …or whatever strikes your fancy. We know you can do better than that! And remember, you could be the lucky winner of a Best Buy Gift Certificate. Ready. Set. DECORATE! Click here to view the complete USPS Guidelines. Create a Grinch inspired diorama of Who-Ville inside your box. Cushion your books by filling your shipment with two dozen double chocolate muffins (each individually wrapped for convenient consumption of course). We want to encourage you to be as creative as possible, but first and foremost, package your books in a way that ensures they will reach our facility unscathed! Still stumped? View a couple Decorate-A-Box examples. This entry was posted in Cash4Books News & Updates and tagged box, Cash4Books News & Updates, contest, creative on November 16, 2010 by Jim McKenzie Smith.